I was reading in the book of Ezra the other day and though I’ve read the book several times, I came across a story in chapter 3 that really struck me like never before. The Persian king Cyrus had commissioned a large group of Israelites to go back to Jerusalem and rebuild the temple that had been destroyed by the Babylonians a few generations prior. As the captives that returned to Israel established the foundation of the new temple, a time of worship broke out in the community. I had to get out my commentary to confirm why I thought the old men were weeping over the foundation. Mr. Halley agreed, the old men in remembering God’s design for Solomon’s temple, wept that the temple they were now building would not match the grandeur of God’s design for the house of worship. Many people shouted for joy as formal worship of the LORD was being restored and there was all kinds of hoopla, yet still there were those that remembered the superiority of God’s design and in some ways were disappointed that the community was no longer at that level. As I’ve journeyed with caring for orphans in Tanzania, I feel as though I’ve aged. It’s been five years now since I accepted the job at Treasures of Africa. When I first started I exuberantly told everyone, “this is my dream job.” I was one of those worshipers that when the foundation was laid, I rejoiced and shouted and worshiped. I was in love with working there and knew that it was where God had called me. It absolutely was where God had called me for the three years I was committed there. I grew in faith and I grew in love. I’m so grateful for the leaders that gave me such an opportunity. I was given an insightful look into these kids’ lives, their backgrounds and their specific needs as they came out of traumatic experiences. By welcoming them to the children’s home they were shown love, they were provided for and were able to rest and recover from the blows that orphan life had left them. Beyond learning about the needs of the kids, I also had an insiders view of how the best orphanage in Moshi was run. I say it’s the best not only because the physical needs of the children are met and they have a clean, safe environment in which to grow up, but because the leaders of the orphanage were very godly people. The kids heard and received the gospel, which to me is most important. 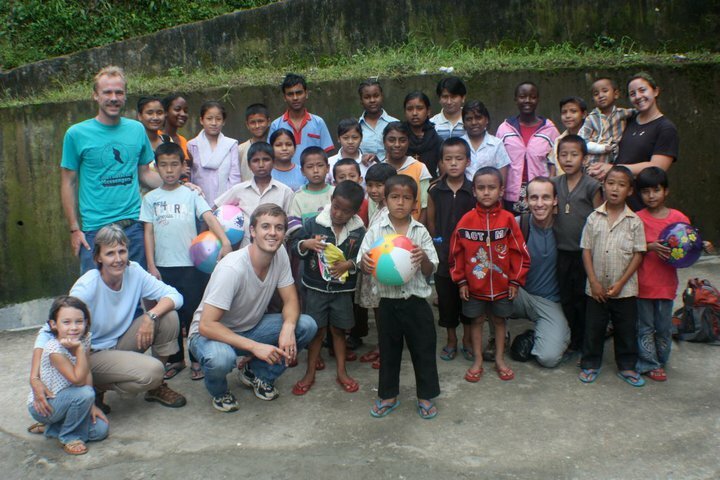 From that insiders view, I have also learned the downsides to the orphanage system. It would be easy for me to look at government orphanages in Eastern Europe or the poorly funded, poorly supervised orphanages here in East Africa, but I’ve actually seen the downsides to the very best orphanages around. I’ve aged. I’ve become one of those old men that weeps as the foundation is laid and remember that God’s design was and is far superior. As I’ve been working through all these things in my head over the last year since we’ve returned, I find myself needing to temper what I say. I personally invested so much in the orphanage system and even more so because I have close friends that are currently ministering in orphanages and most importantly I have a group of twenty-six kids that I love a whole lot that live at a children’s home. The difficulty in navigating what I write and hence other people read is that in critiquing the orphanage system of orphan care, I am critiquing the most common form of orphan care in the world. In many contexts, it’s the only form of care for these kids. Because of all this, it tends to be the type of ministry that you, me and everyone else has supported if you’ve been involved in the biblical mandate to care for orphaned children. There are two designs here that I’m looking at and I in no way want to come across as heavy-handed, pugnacious or cold. I feel the exact opposite towards the orphanage system. I think that it can have it’s role in caring for orphans, but we often see it as the end all in millions of instances and I don’t think that’s good. So the two designs, I humbly submit, is God’s design (Solomon’s temple) and man’s design (the temple in Ezra 3). So, in a nutshell, what are those two designs? As Johnny Carr says “man made orphanages for children, but God made the family for children.” Now that is a pretty strong opinion, I confess. What I’d like to do today is just look at a few themes that we see in the Bible concerning this conversation. 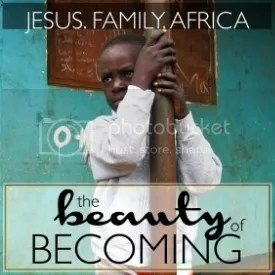 The first thing that we must understand is the fact that the Bible, both testaments, speak a lot to caring for orphans. In the giving of the Law to God’s people in the Old Testament, caring for orphans was something that was expected of each and every individual. In Deuteronomy, God hammers a group of people into the minds of the Israelite community: the widow, the stranger and the fatherless. It was God’s chosen people that were expected to care for the needs of these people. If you read chapter 24 in particular, you’ll see God commanding Israel to preserve justice for the fatherless and also provide them with food from the people’s own crops. It was a commandment, not an option. God demanded that of His people, because they are to be His reflection and hence maintain His own character. They were to administer justice for the fatherless, because He administers justice for the fatherless (Deut. 10:18). They were to help the orphan, because He is the helper of the orphan (Psalm 10:14). 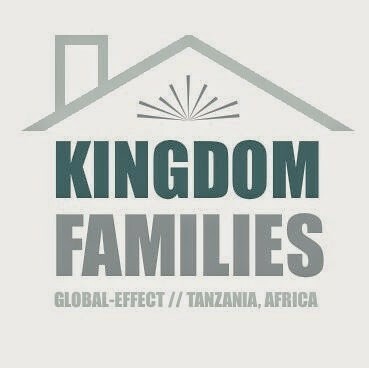 And in keeping in step with who He is, God’s people are to father the fatherless, because that’s who He is (Psalm 68:5). In the New Testament, we see a core spiritual truth about who we are in Christ applied in these same terms. Jesus teaches us to pray to God as ‘our Father’ and in Romans 8, Paul teaches us that we have been adopted as children of God. If we were adopted by God, that means that there was a point when we ourselves were orphans too. God was gracious and brought us into His family. In Christian practice, just as I spoke to a moment ago, what we see God do, we ought to do ourselves. We love because He first loved us. We are commanded to be holy just as the Lord is holy. We give, because He gave it all for us. So if God in his generosity, compassion and righteousness, adopted us orphans into His family, what does that mean for us when we consider these kids that also need a family? In the beginning, God established the family. He put Adam and Eve in the garden and told them to be fruitful and multiply (read, have lots of kids). This was God’s first design, He had a family in mind as the ones that would take care of the earth and expand the garden. This is just a really quick overview of what the Bible says in regards to orphan care and God’s design for adoption and family. Nonetheless, we can gather a few things from just understanding this text. If you were to read the Bible, then be presented with the plight of millions of orphaned children, would you gather that all you need to do is establish an orphanage? The Jews of the Old Testament didn’t do that and it wasn’t until the legalization of Christianity a few centuries after Christ, that Christians started to do it. I propose that there is a better way. God’s original design was for children to be in families. By the power of the Holy Spirit we can get back to that design and see orphans receive what they need most of all, the love of a godly father and mother. Click here to read Part 2 where we’ll talk about some of the practicalities and difficulties that are presented through both the orphanage system and the families model. If you found this post interesting and something to be considered, then I’d appreciate you sharing it. These are conversations within the church that need to take place and every single one of us has a role to play. Not all are called to adopt, but all are called to do something. Yesterday I opened up a conversation about short term missions and some of our blind spots and shortcomings in this popular system. Thanks to those that have shared the article or commented on Facebook. Share your thoughts in the comment section of this blog that way when people read my thoughts, they can read yours too. Lets keep it going. I wanted to continue that conversation today and look at a couple other areas that I see as being a bit off. If you didn’t see the post yesterday (Part 1), I definitely suggest it before you continue with this one. The topics of discipleship and effectiveness are fundamental to what we’ll look at today and in my estimation are more important. Today we’re going to look at a couple other elements and I want to re-iterate what I said yesterday that this not about tearing down what we do or who we are, but building up. We must be aware of our problems, if we are going minister and grow effectively. This is something that I talked about yesterday, but wanted to beat the drum once more. How the trip is funded matters, what money goes towards on the trip matters. The money shouldn’t come in just any way and it shouldn’t be spent flippantly. This gets back to the sacrifice question that I raised yesterday. I had a team leader on one of my past teams advise us that we could put our tithe into our own individual fundraising account. Now, that is truly between a person and the Lord, but it does make me think. If my offering, which would be going towards my church or another Kingdom work, is now going to fund my short term trip, what does that mean for the others that I was supporting with that money? Sure it kind of kills two birds with one stone; I don’t have to be guilty about not giving an offering to the Lord, and at the same time I get myself that much closer to the plane ride across the globe. But is that best? Is that exhibiting trust in the Lord with my finances? Is there something more that I ought to be giving? Something that really costs me something? Speaking of pictures with cute orphans, here’s my India 2010 team. Furthermore, one has to ask if the short term trip is worthy of someone else’s regular offering. I want to raise these questions, because they really matter and too often aren’t addressed. When I went to India in 2010, I had already moved to Tanzania and was living off the support of others in the US. When I felt God lead me to go to India, I didn’t have much opportunity to fundraise for that (which had to be done completely aside from my own organization). Subsequently I had only three people give towards the trip and I paid for nearly 90% of the trip myself. Of the three ladies that supported me, one was a good friend who already supported me at TOA. After reading my blogs from Asia, she told me that she herself often wonders about supporting short termers, because it seems in many cases to be “missionary tourism” as she said. She said that she still supports them, because its not on her to determine their hearts, but the concern is nonetheless there. Especially when the missionaries often stay in the nicest hotel in the city, get a couple days for sightseeing and come back with a bunch of pictures of cute, little orphans. Furthermore, many of the projects that are done on short term teams ought to be done by nationals. All this money is spent to come across the sea and the team paints houses for a few days. That sounds admirable and I don’t mean to belittle anyone, because I believe their heart is almost always in the right place. Not to mention, this is right up my alley as I’ve had teams help paint my house, friends’ houses and the halls at TOA. But think about the alternative, while you spend that money in getting there and take time to do an unprofessional job, your church could have given a fraction of that money directly to the ministry and they could have hired a national to do it professionally. Hence the short termers spent a lot of money to come over and put a national out of a potential job. I took this from a book that I’ll recommend later, but play this scenario out: A team from France contacts your church and wants to come over and do a VBS. They have twelve people on their team that would come, they’d put on skits (in French), talk about Jesus through a translator, have crafts and songs, probably do some things that seem a bit odd (I mean it’s a very different culture over there) and after they spend the week at your church, they’ll ask if you could take them to the nearest tourist attractions. They’d then head back to their own country after about a week and a half. The airfare for their team cost nearly $20,000 to travel during the summer and they spent another $10,000 on supplies, food, lodging and sightseeing. Now, let’s say they’re a forward thinking group and they say “or we could just give you $30,000 to do your own VBS and whatever other ministry the money could help.” What would you do? You’d take the money! And you know what? You’d be way more effective with it than them! I’m not saying we just throws gobs of money around (because it only works if its strategic… and we do that often enough anyway), but I think you catch my drift that maybe the way we often spend isn’t the best, nor the way that we fundraise. Africa. Pause for a second and tell me, what comes to mind when I say that? I’ve called Moshi, Tanzania my home for the last two and a half years. Moshi is merely a small town on a massive continent. Check the photo inset that I think is ingenious. 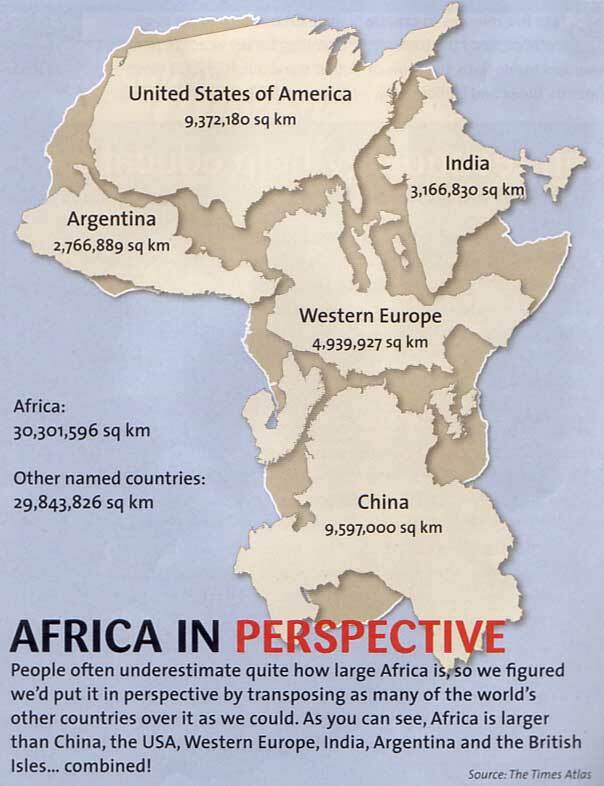 And its not just land mass, but the population of Africa is over 1 billion. Nonetheless, I constantly hear people make these bold claims after only a couple days in Moshi about “Africa is this” or “Africans do that.” I’ll tell you that it bugs me and people, even other missionaries, have told me that it’s just a pet peeve of mine, but I truly think that we are walking on thin ice with these broad generalizations. First off, they very often aren’t accurate. Certainly not of the entire continent which is so incredibly populous and diverse. But often coming to any conclusion of a totally new culture after only a couple days or couple weeks is just unfair. There are so many layers to culture and teams hardly scratch the surface. There are friends of mine that have been there for so much longer than me and even they haven’t plunged the furthest depths. After fifteen, twenty years, they’re still learning. Furthermore, when we come up with these generalizations, we not only miss the point, but we miss the heart of the people who behave in a way that we don’t understand at the surface. For example, Tanzanians, especially the Masai people, practice very long greetings for one another. I kid you not that in a normal conversation, people will just greet one another for a couple minutes. Americans say, hi, how are you, and then cut to the chase. Tanzanians often ask not only how are you, but they’ll ask how their family is doing, what’s the news at their home, and all sorts of other greetings that wouldn’t even make sense to you if I translated them into this post. To an American, they could conclude that Africans waste time in conversation and aren’t straightforward. They then post some broad generalization on their Facebook. In reality, Tanzanians are very relationship-based more so than Americans in many ways. They greet one another, because they enjoy talking with one another, they want to see how they’re friend is doing and be polite, cover all their bases even. It makes the utmost sense in their own cultural setting. Beyond that, I’m willing to bet that people in Tanzania (Africans) are a lot different from Algerians (Africans), Namibians (Africans), Egyptians (Africans) or even the neighboring people of Mozambique (Africans). Cultures are different, languages are different, customs, religions and standard of living are all very different. Imagine if I took four Tanzanians and sent one of them to Idaho for a couple weeks, then another to Guatemala, another to Quebec and still another to Cuba. I then ask each of them to tell me what North America is like. What would their responses be? “Its cold there,” “Its hot there,” “They speak English,” “They speak Spanish,” “They speak French,” “They’re rich,” They’re poor,” “They’re capitalist,” “They’re communist,” “They’re welcoming,” “They’re snobby” and so on. Aside from being insulting and belittling to those to whom we ought to be serving, false perceptions end up perpetuating poor development practices. When I told you to think of Africa, did the word “poor” come to mind? It probably did. The truth is many Africans, across country lines live off far less then Americans do. The majority are indeed impoverished. However, when the main perception becomes strictly “poor,” we typically jump to some form of relief (which I discussed yesterday), not realizing that many African countries are rich. They’re rich in natural resources and in man power. They have the ability to become a thriving 21st-century country, but won’t do so if everyone just thinks “poor” then sends relief. Furthermore what’s needed in Cameroon will probably differ a lot from Libya or Madagascar. As you can easily gather, so much of these false perceptions are remedied by a humble approach to relationship which gets us back to the discipleship that I discussed yesterday. Discipleship is the hinge on which effective global outreach hangs. I hope you’ll come back and check the blog in a couple days to hear some ideas that I believe would get us to more effective discipleship in missions. I believe in the work of the Holy Spirit stirring up compassion and justice in our hearts. So check back in on Monday to hear more.